So this year has been exceptionally kind to me when it comes to harvesting grouse. We have two species here that can harvest, the Blue Grouse and Rough Grouse. I have managed to bag 3 Blues and 7 Rough so far this year. Last year I didn't get a single one and the year before I came home with a pretty nice load as well. I have two brothers and in two years I have killed more Grouse then they have in an entire lifetime. Both of them older then I am. I thought I would share a couple pics to show you folks some of my quarry. Here we are legal to hunt this bad boys with shot gun or rim fire and although all of these where taken with a 12 gauge I picked up earlier this year I usually tag these little guys with a .22 in the head or neck. I have had some success with a .17 this year as well. 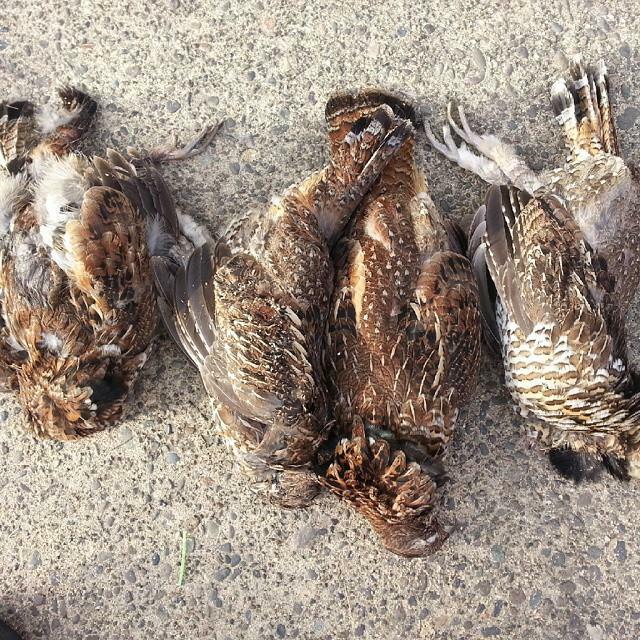 4 Rough grouse I bagged in an area I had not hunted before as well. Two Blues I bagged in some new hunting grounds I was testing out. I thought I would at this picture from two years ago when I shot the biggest grouse I have ever gotten. Nailed this one in the head with a .22 and he was so big rather than use the breast-less technique I decided he was worth skinning out. Somewhere I have a picture of this one sitting on a dinner plate and its legs hand off the plate. Wonderful pictures, tlo7mm. Great looking birds. The 22lr sure keeps the meat looking pretty. Wow the grouse in your neck of the woods are very red. Ours are more grey'ish blue. Sadly our grouse got clobbered this year by a June snow storm that killed the clutches. Very few grouse around... but my boy has picked off a pair so far for the year as we hunted other critters. Tlo, how do you hunt them? Without a dog? Then maybe you want to teach Stovey a few tricks... and I'm also always willing to learn. I love those birds, great haul! Always wondered what kind of habitat do you look for to find them? I've seen them on the logging roads once in a while but I don't know what to look for as far as where they live. Any clues? Around here high alpine areas, where the treelines end. Been a long time since I've had grouse. 20 some years ago they were everywhere, last year was the first time in a long time I've seen one. Almost had to change my shorts when it went up. That's where i look for them Suzanne. Like Dallan said they stick to tree lines which is why you find them on logging roads but in the timber not in clearings. Dallan the grouse that you can see up close are rough grouse and have reddish brown feathers. 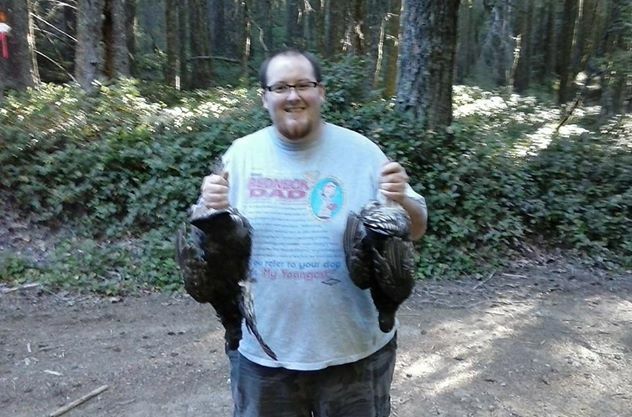 The two I'm in the picture are blue grouse which sound more like what you guys have. I'm setting up my sons 222 so he can start knocking them off with me. He will be 8 in mMarch and he loves hunting. He wanted to help me drag my deer out this year but Mom and grandma wouldn't let him because of how bad the clearing was that I got it in. I thought I would at this picture from two years ago when I shot the biggest grouse I have ever gotten. 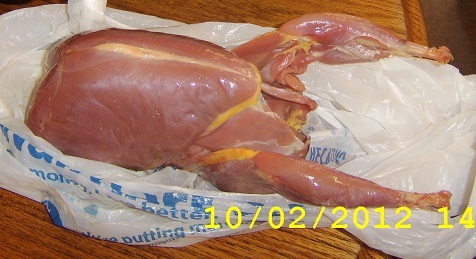 tlo7mm, the breast meat to legs on that one dwarfs a Thanksgiving turkey. That one must have been able to lift-off like a rocket. What recipe do you use? My wife usually just seasons them with poultry seasoning and bakes them in the oven. I am considering trying grouse Parmesan. It is a much sweeter meat then Turkey or chicken in my opinion. If anyone has any suggestions how to fix them I am open for suggestions. I am always up to trying something new.